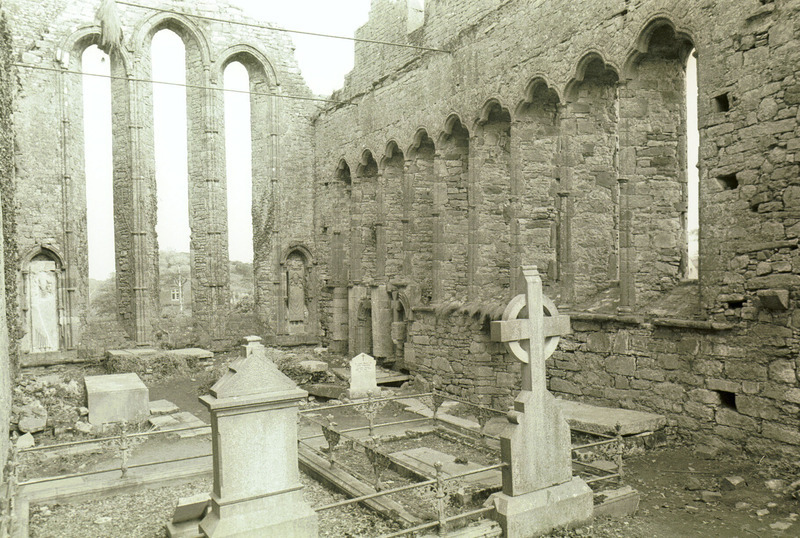 “Ardfert Cathedral, Ardfert, Co Kerry, interior - east end of choir,” Gothic Past, accessed April 23, 2019, http://gothicpast.com/items/show/1182. Photograph by Roger Stalley. View of east end of choir showing graded triple lancet windows with banded shafts and foliate capitals, hood mouldings and label stops. A piscina flanks the outermost lancets, each one currently containing an effigy of a bishop holding a crozier. South elevation shows nine trefoil - headed lancet windows flanked by shafts with multiple annulets; south - east elevation has remains of sedilia showing dogtooth arch moulding; elevation shows putlock holes to the west of the ninth lancet.